The export achievements of businesses across the east of England have won praise in this year's Queen's Awards for Enterprise. In the region, awards in the international trade category went to companies in Bedfordshire, Buckinghamshire, Essex, Hertfordshire and Norfolk. The winners included Aston Martin, which is based at Newport Pagnell in Buckinghamshire. 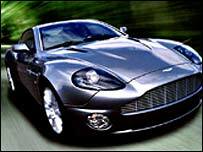 The firm, which employs 827 people, produces high-performance sports cars, including the one used in the latest James Bond film Die Another Day. Another winner was Hibreeds International, of Old Catton, Norwich - a company which exports poultry hatching eggs. The company, which employs just four people, has seen its exports more than treble over the past three years - the main markets being the Middle East, the European Union, Turkey and Cyprus. Beautimatic International, of Witham, won the award for the second time. The perfume manufacturer has seen its exports grow by 96% over the last three years. Electronics and laser firm Photonic Products, of Bishops Stortford, also received an award after seeing its overseas earnings increase by 352% over three years.